We are in no way affiliated with Costco besides our membership to shop there, we just love it. Low-fat or no-fat diets go in and out of style. I am of the belief that we need contributions from each of the six groups of nutrients (carbohydrates, fats, protein, vitamins, minerals and water) to make up a healthy diet. I shoot for about 20% of my calories to come from fat. Fat helps keep our skin soft, delivers fat-soluble vitamins, and can be a great source of fuel for your body. This doesn’t mean you should go running out for a cheeseburger to keep your body at its best. Not all fats are created equal, but you’ll be happy to know you can find many sources of healthy fats for an affordable price at your local Costco! Costco also is a winner in my book because of their excellent business practices, from bringing in more organic products, to paying their employees a living wage! Their CEO even has his own meme, Good Guy CEO of Costco. Here’s the list of healthy fat rich foods we got on our trip today. Almonds and almond butter contain monounsaturated fats and are full of calcium and fat soluble Vitamin E.
Avocados are mostly unsaturated fat with a small amount of saturated fat, and are packed with vitamins, especially C & K.
Coconut Oil is a saturated fat and less than 10% of your calories should come from saturated fat, but it contains medium-chain fatty acids, unlike most saturated fats that are long-chain fatty acids, so they are used by your body in a more effective way. The health benefits of coconut oil are almost endless, but that doesn’t mean you should eat endless amounts! Enjoy in moderation and reap the benefits. Chia Seeds are the same little guys you used to grow on terracotta sheep, but they are an amazing source of Omega 3 & 6 fatty acids, dietary fiber, lot of minerals including calcium and manganese, and have even been shown in studies to prevent spikes in blood sugar! Wild Alaskan Salmon Burgers (not pictured, in freezer) are delicious and a serious powerhouse of nutrition. We eat very little meat, but the occasional salmon burger over spinach and brown rice is a much enjoyed treat in our house. 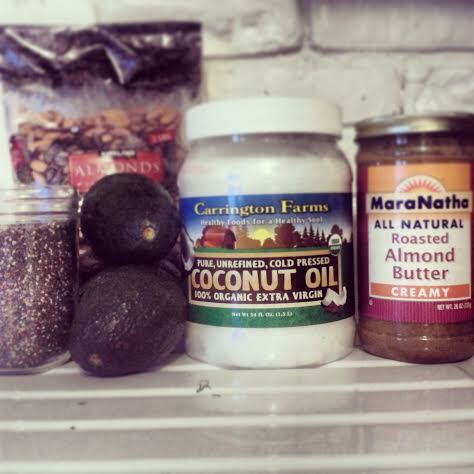 How do you incorporate healthy fats into your diet? This entry was posted on February 13, 2014 by Chef Jill in Nutrition and tagged almonds, chia seeds, coconut oil, Costco, Grocery shopping, health fats, medium-chain fatty acids, omega 3, protein, Salmon.